The term codependency has been around for almost four decades. Although it originally applied to spouses of alcoholics, research revealed that the characteristics of codependents were much more prevalent in the general population than had been imagined. Co-dependence is a learned behavior. It is an emotional and behavioral condition that affects a person’s ability to enjoy life long happiness. Co-dependents often look for anything outside themselves to make them feel better. People Pleasing: It’s fine to want to please someone you care about, but codependents usually don’t think they have a choice. Saying “No” causes them anxiety. Some codependents have a hard time saying “No” to anyone. They go out of their way and sacrifice their own needs to accommodate other people. Poor Boundaries: Boundaries are sort of an imaginary line between you and others. It divides up what’s yours and somebody else’s, and that applies not only to your body, money, and belongings, but also to your feelings, thoughts and needs. That’s especially where codependents get into trouble. They feel responsible for other people’s feelings and problems or blame their own on someone else. Reactivity: A consequence of poor boundaries is that you react to everyone’s thoughts and feelings. You might take things personally and get easily triggered. If someone says something you disagree with, you either believe it or become defensive. Care-taking: Codependents often put other people ahead of themselves. In fact, they need to help and might feel rejected if another person doesn’t want help. Moreover, they keep trying to help and fix the other person, even when that person clearly isn’t taking their advice. For some codependents, their self-worth is dependent upon being needed. 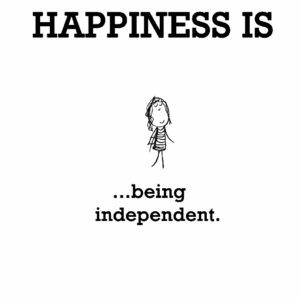 Dependency: Codependents need other people to like them to feel okay about themselves, and they’re afraid of being rejected or abandoned, despite the fact that they can function on their own. Often times, they don’t know what they’re feeling and are instead focused on what others are feeling. The same thing goes for their needs. They pay attention to other people’s needs and not their own. making mistakes, being a failure, being close and feeling trapped and being alone. The good news is that co-dependence can be turned into independence. It starts with awareness and a decision to seek help to learn new habits and actions. let’s see if coaching is right for you or someone you love!! !